Are you TRULY free? I am not talking about living in a “free country” or anything like that. Are you willing? Slow down. Breathe. Connect with kind and loving people. Be kind and loving to yourself. Be willing to release that list above and anything else that might be impeding your sense of exquisite fulfillment. To paraphrase a favorite author, Gay Hendricks ~ Why not get willing and see what happens? How do you show up? Commit. Last week we talked about deciding how you want to show up. Have you gotten clear on why you want to become your most powerful self? If so, then you are ready to start building momentum to get closer to your ultimate goal. Before you dive in, take a look at the quote above. How do you feel about enthusiasm being the energy and force that builds momentum for your soul and mind? Make the connection. When you connect your heart and mind to why you want anything, you are much more likely to achieve your desired outcome if you infuse your action steps with enthusiasm (or as I like to call it: taking inspired action). If you want to ensure that the momentum you build is productive, I invite you to pause for a moment to get straight with yourself. Now that you have made the decision to show up (strong, enthusiastic, confident, prepared, however-you-want-to,) it is time to make a commitment. If you want to move quickly toward your goals, then I invite you to embrace the idea of slowing down to speed up. In the interest of keeping things simple and easy to implement right now, I have laid-out 3 simple steps for how to commit to becoming your most powerful self. 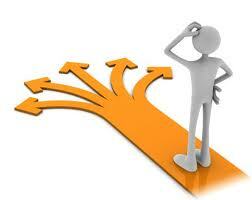 Decide on your desired outcome. Paint the picture of your highest self. Simply put, decide how you show up. Close your eyes and picture your best, strongest, most capable and confident self in a natural setting (work, home, social settings, etc.). Write it down. Write in the present tense to embed it into your mind’s eye and help make it real. How will achieving this outcome affect other aspects of your life? Keep it Simple, Sweetheart (KISS). This is where people often derail their success by over-complicating, adding unnecessary details and getting stuck in the “how” of it all. Simplify. Keep it simple. Focus on 1-3 attributes you would like to develop. The key here is that the simpler it is, the easier it feels, and the more likely you are to take action, which is step 3. Take consistent inspired action. What is one thing you can do right now to get 1% closer to your goal? Choose the easiest thing and do that first. Remember that if you take inspired action (refer to #1) and stay focused on the outcome you desire - showing up as your most powerful self - you will create momentum, and you may agree, momentum is your friend. Just take a step, and don’t worry about the rest. Your character helps formulate how you want to show up. Once you made a decision, you already putting the change in motion. If you change your mind, you can change your life, and so taking inspired daily action is the best way to move yourself closer to your goals. It may seem a little challenging to track progress with something such as your character and how you show up, so I have come up with a very simple 2-step process to help you keep track, and get this: it will help you be consistent and take daily inspired action. Do you like that? If so, then keep reading! Write an action list of no more than 3 items to complete each day. My fabulous coach calls it the “Daily D.A.S.H.” (Definite Action Steps Happening). Write your DASH, by hand, every night before bed so you know how your next day is going to start. You can choose the same 3 actions every day, or other actionable items that you can complete by noon each day. Acknowledge and celebrate ALL successes. This is as simple as saying “I did it!” when you finish your DASH by noon. Or, you could share your succes by telling a friend or co-worker. The idea is to acknowledge that you have made progress, which is getting you closer to your goals. Keep in mind that this journey to showing up as your highest self is a series of steps, and each step is taken in that moment, not in any other moment. Contemplate this quote by Eckhart Tolle. Next week we will make adjustments. I will show you how even though it is “off-track” 97% of the time it is in orbit, a space shuttle will always reach it’s final destination. There, you can exhale now. You don’t have to be perfect in every step. Simply take one step now. Then take another, and another and another..
Are you ready to commit to yourself? Want to go beyond blogs and videos? Let’s chat! Click on the connect button below, or email me directly to request an interview.